Born in 1935 in Kievets village, the Novgorod district. In December 1944, moved to Leningrad with her family. In 1958, graduated from Leningrad State University, the Faculty of Oriental Studies, the Department of The History of Near and Middle Eastern Countries. From 1958 up to 2016, worked at the Institute of Oriental Manuscripts (former the Leningrad/St Petersburg Branch of the Institute of Oriental Studies). In 1977, defended the PhD Dissertation. In 1992, was given the Habilitation degree for the book South Eastern Kurdistan [Юго-Восточный Курдистан]. Major research interests: the history of Kurds and Kurdistan from the Middle Ages to Modern Times. 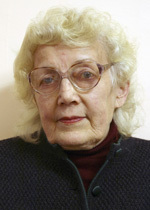 Vasilyeva E.I. South Eastern Kurdistan from 16th to 19th Century. Sources on the History of the Kurdish Emirates of Ardelan and Baban [Юго-Восточный Курдистан в XVI—XIX вв. Источник по истории курдских эмиратов Арделан и Бабан]. St Petersburg, Nestor-Istoriya 2016. 176 p. ISBN 978-5-4469-0775-5.